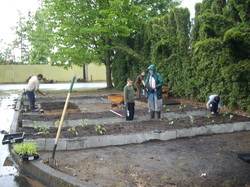 In May of 2009 the Marion-Polk Foodshare helped us convert our west side lawn area into an attractive garden space. Several families in our neighborhood came out on a rainy Saturday to cut out the lawn, lay cinder blocks and shovel dirt. And every summer on Friday evenings all the children marvel at the growing plants, eager to sample a leaf of lettuce or cherry tomato plucked fresh before their eyes.